According to one estimate, between 30 and 50 million prescriptions are dispensed inaccurately each year. LinkSquare tries to ensure that the people manufacturing and distributing pills know exactly what they're doing. We have a lot of help when it comes to tracking the contents of our food. Devices like the Nima sensor are capable of monitoring the quantities of specific micronutrients with a great deal of accuracy, and fashion-forward innovations like the Allergy Amulet can help you quickly spot peanut traces and other potentially harmful allergens. But what about tracking the pills that we consume to make sure we’re taking the right ones–or even being aware of what’s in them? They’re sure as hell not easy to tell apart from appearances, and we’re left to trust the caregivers and pharmacists who distribute them to know what they’re doing. Stratio Technology has come up with a way to minimize the human error that can creep into the process of distributing, administering and ultimately ingesting drugs. It’s a handheld scanning device called LinkSquare, and it’s capable of identifying exactly what pill you’re about to consume. The device works in tandem with a mobile app. You start by holding down a button for three seconds to activate its WiFi network, over which LinkSquare communicates with its companion app. Then you simply point the business end of the device over a pill, and within seconds the app displays its commercial name, along with a scale that shows its confidence level (from ‘low’ to ‘high’) in its ability to identify it. LinkSquare currently uses a silicon-based sensor, although a proprietary germanium-based Short Wave Infrared Sensor is being developed for future iterations. The sensor uses light shined into pills to study the wavelengths that are absorbed and reflected by them. Due to their differing compositions, each one has a unique spectroscopic fingerprint. Whenever a pill is scanned, the app tallies its spectral features against a database that has been built by sampling various types of medication. Machine learning and statistical methods are used to reach a final conclusion on the nature of the drug being scanned. LinkSquare is currently targeting its product at enterprise customers, such as pharmaceutical companies where technicians bottle pills, and the dispensaries where they’re visually verified before being sold. According to one estimate, between 30 and 50 million prescriptions are dispensed inaccurately each year. 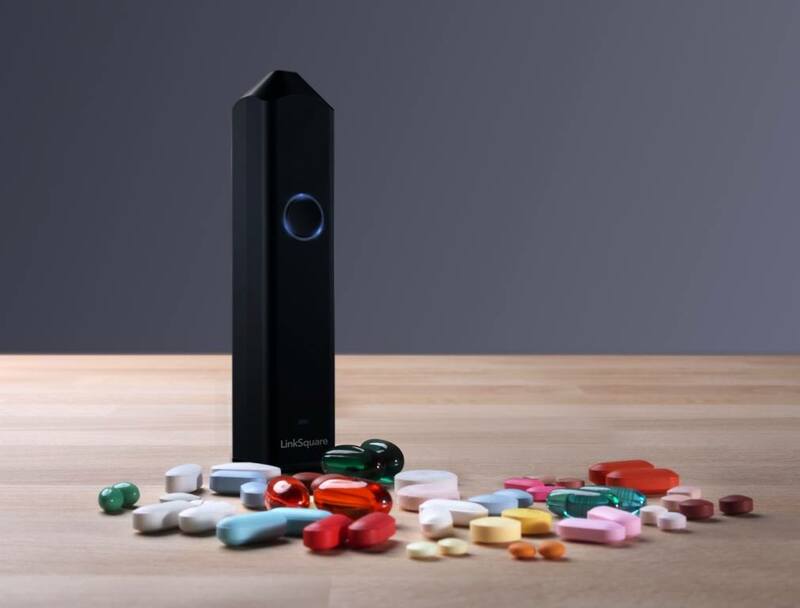 By putting expensive spectroscopy equipment in a portable (and hopefully affordable) form factor, LinkSquare offers a simple way to avoid the potentially fatal ramifications of misidentifying drugs. For enterprise clients, the device is priced $250. A variable fee may be charged for setting up a custom reference library of pills. Leslie Grothaus, Stratio’s VP of Business Development and Communications, tells Snapmunk they will begin working with enterprise clients in March. In addition to the hardware unit, there will be a LinkSquare SDK on offer to the public. The SDK will allow the collection of raw spectral data from objects and export it to third-party software. The analysis of this data can provide more nuanced results than the standard insights that LinkSquare provides. At this point, Stratio does not offer data analysis services to SDK users, so they will need to carry it out on their own. The sales of the SDK will begin in March, at a price of $750 (inclusive of one LinkSquare device). The team behind LinkSquare is headed by South Koreans Jae Hyung Lee, Su Ryeo Oh, Yeul Na, and Youngsik Kim. The device was first presented as a prototype at CES 2016. It returned to the 2017 edition of the event to show off the updates that had been made since. Pill identification for those that cannot remember and security for those that cannot watch them all the time is ideal! It seems to me that there is a lot of room for this type of tech in the health care world. This is the second pill device that you have written about. Its good to see.